The mighty Kanchenjungha was visible throughout the day in Siliguri but north Bengal's travel industry has started to fret that tourist traffic may taper in January, given the demonetisation induced cash problems. According to tourism industry stakeholders, about half the tourists who visit the region around the year travel in an unorganised manner from other parts of Bengal. In other words, they do not arrange trips through tour operators. 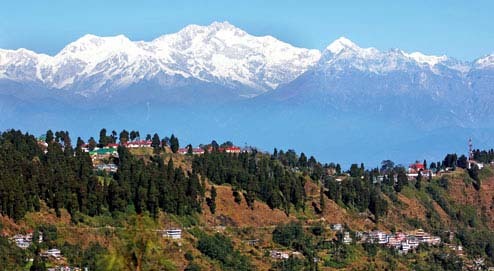 A group of tourists may land in Darjeeling and look for a hotel and then book car rides by paying cash to the drivers. "They make travel and accommodation arrangements on their own. In many cases, tourists, after reaching transit points like Bagdogra airport and New Jalpaiguri railway station, finalise the transport. In a similar manner, they select and finalise hotels after reaching at the destination," Samrat Sanyal, the executive president of the Eastern Himalaya Travel and Tour Operators' Association, said. A section of these tourists, he said, might stay away as they need to make cash payments in most of the cases. "Hotels which are three-star or higher in the grade usually have card swapping machines. But most of the hotels which are small, whether in the Dooars or the hills, do not have this facility," Sanyal said. In a similar manner, there is no facility to pay car rentals - whether for sightseeing or travelling to destinations from transit points - without cash. "Even in the prepaid taxi booths, a person needs to pay cash to hire a vehicle," a tour operator based in Siliguri said. A source in the Eastern Himalaya Travel and Tour Operators' Association said Darjeeling, Dooars and Sikkim cumulatively have around 5,000 hotel rooms and in the Christmas-New Year season till January-end, 85 per cent of the rooms are occupied. The source added that going by the demand this season, occupancy could taper at 65 per cent. Raj Basu, a veteran in the tourism sector of north Bengal and the Northeast, said: "It is not that the hills and the Dooars would be empty during the Christmas holidays and New Year. But the flow of tourists as whole, we suspect, would be less." Other than the cash crunch, there is no other reason to keep tourists away. "The weather is pleasant and the mighty Kanchenjungha and other peaks are clearly in view. All the roads are in motorable condition and there is no political tension in the Darjeeling hills which can impede tourist movement. We were expecting a good turnout till the middle of January but this cash crunch appears to be the sole reason that would hold back some tourists," Sanyal said. That the tourists might face problems was clear as some people planning the trips are coming to grips with the cash problems in their home towns. Saugata Basu, who works in a private company and has planned for a trip to Bhutan on his own on next week, said the whole idea had landed him in a lot of trouble. "First of all, most banks in Siliguri are not giving Rs 24,000 (the weekly ceiling of withdrawal). Last week, I could manage to get only Rs 15,000 through cheques. Also, for the past 10 days or so, I have been standing in ATM queues everyday and withdrawing Rs 2,000, a portion of which is spent on meeting daily expenses," Basu said. In total, he could gather around Rs 25,000 so far. His trip is scheduled for next weekend and would cost around Rs 55,000. This means, he would have to go to the bank at least twice to withdraw cash and stand in ATM queues. Added to that, he needs to make some other arrangements.